I picked this up from a couple of newspaper items from Australia which mentioned that a touring production of The Shamrock and the Thistle was based upon Robert Buchanan’s novel, Lady Kilpatrick. Certainly the plot was the same, but the names of the characters had been changed; not, I would suggest, to protect the innocent, but more to shield the guilty. The first appearance of The Shamrock and the Thistle was in 1898 and was performed by the Henry Dramatic Company. It had been adapted from Lady Kilpatrick by the Company’s actor-manager, Robert Henry (aka Robert Henry Nicholls, who was later taken to court on two occasions for theatrical plagiarism) and another actor with the Company, W. J. Coulter. Robert Henry had spent some time as an assistant stage manager with the Brough and Boucicault Company which is perhaps coincidental and nothing more; too slight to make a case for The Shamrock and the Thistle being a version of The Squireen. There does not seem to be any evidence either for Buchanan knowing about this antipodean version of Lady Kilpatrick and certainly no evidence that he tried to have it stopped. 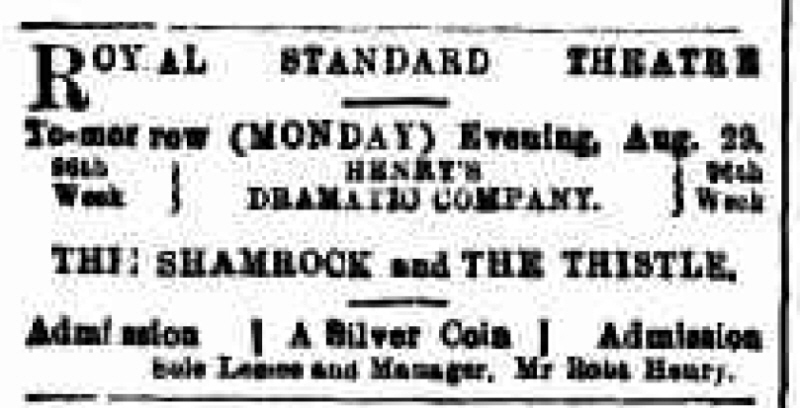 The Shamrock and the Thistle seems to stop being part of the Henry Dramatic Company’s repertoire in 1900. It then reappears in June, 1914 for several performances at Brisbane’s Theatre Royal. Presented by King’s Royal Dramatic Company this version, again keeps the plot of Lady Kilpatrick, but names of the characters are changed again. So, whether this was a new adaptation of the novel, or a reworking of Henry & Coulter’s adaptation, I have no idea. “The Shamrock and the Thistle” will be produced at the Royal Standard Theatre to-night by Henry’s Dramatic Company. Mr. Robert Henry as Lindsay, a trusted servant, and Miss Billie Howarde as Lady Elsie, will be supported by a cast of 12 characters in the Irish drama. A movement is now on foot to organise a benefit entertainment for Mr. and Mrs. Henry prior to their departure for New Zealand. THE Henry Dramatic Company put on ‘The Shamrock and the Thistle,’ before a crowded house, last night. The piece went with remarkable smoothness and the various stirring situations and incidents were finely mounted and given proper prominence to by the clever company. Miss Billie Howarde looked charming and played splendidly as Lady Elsie Fitzgerald and Mr Henry made the part of Lindsay a masterpiece. ‘The Shamrock and the Thistle’ will be staged again on Monday and Tuesday nights. The Henry Company leaves for a New Zealand tour on September 28 and with a view to according the talented and popular pair, Mr and Mrs Henry (Miss Billie Howarde) a fitting farewell, a meeting was convened, at Quong Tart’s rooms, King-street, on Friday afternoon. Mr J. M. Chanter, M L A. was voted to the chair and after a considerable amount of discussion, during which all present evinced a most hearty unanimity in the desire to give them a good testimonial, it was decided to leave preliminaries in the hands of Messrs Chantur, Sam Smith and E. W. O’Sullivan M’s L A, P J Brennan and T J Houghton. The affair is to take the form of a farewell benefit and presentation, to be given in one of the uptown theatres about the 19th September. It was agreed that tickets (3s, 2s, and 1s,) should be issued forthwith. The patronage of Lady Hampden is to be evoked and no effort spared to make the compliment one worthy of those it is intended to honor. As a first change of programme, the Henry Dramatic Company last night staged a piece of dramatic literature of “the villain still pursued her” type, under the title of “The Shamrock and the Thistle.” It is one of those melodramas built on good conventional lines, with situations ranging from pathos to bathos, and containing good vigorous villainy, tempered with mild humour and soft whisperings of love. The writing is the joint work of Mr. Robert Henry and Mr. W. J. Coulter. The story is about an Irish lord who went wrong in his youth, and had a son whom he hadn’t the pluck to acknowledge until the boy grew up and learned the secret for himself, and then, of course, the erring papa wanted to acknowledge him before the whole world. But the boy was not built that way, and disowned his father until, as it does happen in these cases, he accidentally met his mother, who was supposed to have been dead for 18 years, and discovered that she and his father had been legally married all the while, though they did not know it. The sinful lord, of course, has a wicked brother, who desires to purloin the estates from the rightful heir for his own son, and is assisted by hired menials of a somewhat comic disposition. The crowning spectacular sensation of the piece is the burning of an old mill inhabited by the missing mother, whom the villains wish to cremate as a happy solution of all difficulties, but fail, as usual. Two particularly good character sketches are given by Messrs. Robert Henry as Lindsay, an old Scotch retainer of Lord Fitzgerald, and Mr. H. N. Douglas as Patrick Walsh, an ex-parson and connoisseur of good whisky, while Miss Billie Howarde and other members of the company lend satisfactory aid in impersonating various people necessary to the play, which will be reproduced this evening. Henry’s dramatic company appeared at Rangiora on Monday night in “The Shamrock and the Thistle.” The piece was excellently played, but the audience was not large. “The Shamrock and Thistle” is a very presentable specimen of the love-and-hate melodrama which has a habit of cropping up at intervals under a variety of names. It has one or two good acting characters, and is written with some regard for conventional rules. It is, perhaps, the best drama in Mr Henry’s repertoire, and on that account deserved a larger audience than that which listened to it at the Theatre Royal last evening. Miss Billie Howarde acted naturally and pleasantly as Lady Elsie, and Misses Moore, Hartley and Willis filled the other lady parts very well. Mr Robert Henry gave a really excellent presentation of Lindsay, Lord Fitzgerald’s old valet. Mr Coulter was good as the nobleman, and the other characters were fairly sustained. The drama was very well staged. To-night “Outlaw Kelly” will be played. Mr Justice Stephen, at Sydney, recently had before him an application on behalf of Robert Henry Nicholls, actor manager, for the setting aside of a writ ca. re. under which he had been arrested. The plaintiff, Denham, is the proprietor of a play named “The Kelly Gang,” while the defendant is the proprietor of another play named “Outlaw Kelly.” Denham had brought action against Nicholls to recover £500 for alleged infringement of the copyright. Defendant was arrested on the suit of Denham on the ground that he was about to leave the colony. Nicholls, whose professional name is Robert Henry, denied that he intended to leave the colony except temporarily. His Honor ordered that the ca. re. be set aside, and said that in his opinion the act under which these writs were granted was too stringent considering modern conditions. The Equity Court to-day granted an injunction, with costs, restraining Robert Henry Nichols, of the Henry Dramatic Company, from playing a farce under the title of “The Wrong Mrs. Wright.” The applicants were Thomas William Broadhurst, George Howells Broadhurst, and George Willoughby Dowse, theatrically known as George Willoughby, owners of the rights in “The Wrong Mr. Wright.” Defendants said the farce was an adaptation of “Jane,” but the Judge said the title might not only deceive the public, but was inappropriate. Dozens of other titles could have been selected. Robert Henry (“Bob”) has again got himself mixed up with injunctions and other undesirable things. Not long ago Charles Arnold kept Henry in gaol for six months for doing “What Happened to Jones.” Apparently that had no effect, for he has now been in trouble over “The Wrong Mr Wright.” An injunction on behalf of George Howells Broadhurst, of New York, and George Willoughby Dowse, theatrically known as George Willoughby, of Sydney, has been taken out to restrain Robert Henry Nicholls, otherwise known as Robert Henry, from producing a play entitled “The Wrong Mrs Wright.” An adjournment was granted on the terms of injunction for a week. Minnie Evelyn Nicholls, formerly Jones, petitioned for a divorce from Robert Henry Nicholls on the ground of desertion. Mr. Boyce appeared for the petitioner, who stated that the parties were married by the Registrar-General in April, 1891. She was an actress, and they lived happily until respondent commenced to drink, and then he treated petitioner very badly. She went travelling, and sent him 10s a week, as he was very poor. When she returned he said he washed his hands of her. She tried to find him afterwards and failed. He said he was going to America. After further evidence was given on behalf of the petitioner, further hearing was adjourned sine die. I came across two posters for the Henry Dramatic Company, neither of which advertised The Shamrock and the Thistle. 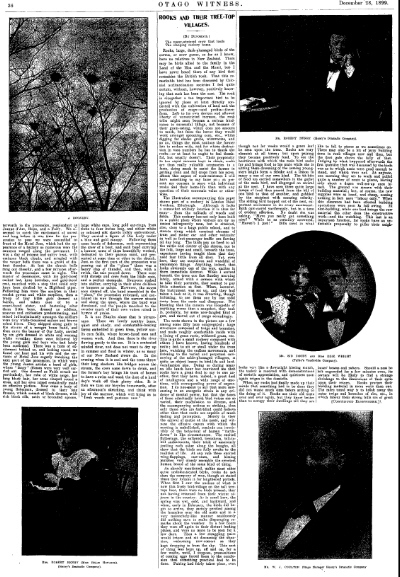 For Billie’s sister, Kate Howarde, there’s plenty of material out there, but the only photographs I could find of Robert Henry, Billie Howarde and W. J. Coulter were on this page from the Otago Witness of 28 December, 1899. Sometimes with these black and white (as opposed tob grayscale) scans you can messa round with the pictures and make them a bit more recognisable, but this one was beyond my capabilites. Click the picture for the pdf file, but it won’t do you much good. The next appearance of The Shamrock and the Thistle is in Brisbane in 1914. This production credits Robert Buchanan and the source of the play (presumably there is less chance of a court case since Buchanan has been dead for thirteen years) but the names of the characters have been changed yet again. At the Theatre Royal to-night will be presented a dramatisation of Robert Buchanan’s novel, “Lady Kilpatrick,” in four acts, entitled “The Shamrock and the Thistle.” The play should make a special appeal to all lovers of melodrama. Considerable attention has been paid to scenic effects, and the play will be produced as usual by the people’s popular players—King’s Royal Dramatic Co.
A dramatisation of Robert Buchanan’s famous novel. “Lady Kilpatrick,” was presented at the Theatre Royal on Saturday night under the name of “The Shamrock and the Thistle.” The plot turns on the reality or otherwise of a marriage between Lord Falconer and a girl named Nora Dennis. The man believes that the girl is his dupe, and has bribed a dissolute clergyman to perform a mock marriage. A son is born to the two, and later upon learning that she had been duped, Nora Dennis disappears, and is believed to be drowned. But she was not drowned. After 19 years she turns up again. Her son Brian meantime has been brought up as a protégé of Lord Falconer, and has fallen in love with the peer’s niece, Lady Lucy. Richard Darvall jun., who is a nephew of Lord Falconer, also loves Lady Lucy, and to put an end to Brian’s pretensions to her hand tells the young fellow of his illegitimate birth. The story works its way through a maze of difficulties, introducing dramatic and exciting situations including Brian’s rescue of his mother from a building set on fire by the villainous Darvalls, father and son, and finally reaches a happy conclusion when Patrick O’Malley, the silenced priest, proves Lord Falconer’s marriage to have been a real one, and thus establishes Brian’s right to be regarded as his son. The cast for the play includes Mr. Geo. Harpur as Donald (a faithful retainer in the service of Lord Falconer), Mr. Collet Dobson as Lord Falconer, Mr. Augustus Neville as Brian Dennis, Mr. V. Fitzherbert as Richard Darvall, jun., Miss Raleigh as Nora Dennis, Miss Kathleen Arnold as Lady Lucy, and Mr. Jefferson Taite as Patrick O’ Malley, the priest.